An abridged version of PING attempts using the same base string, with differing upper- and lower-case chars. The following table sums up the results from the preceding sequence of PING attempts (plus another item I chose not to include). It basically shows that NetBIOS name resolution has its apparent quirks. To me, there’s one captivating thing about the outputs. 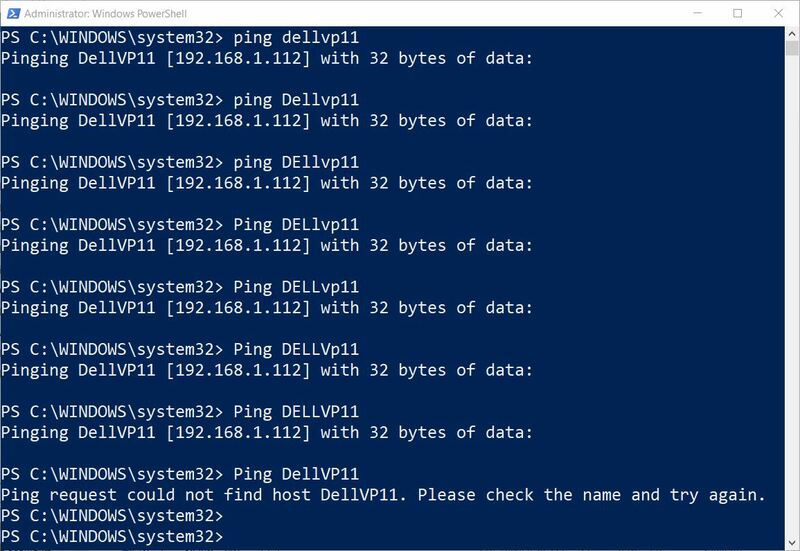 The only string that DOESN’T work is also the same string that PING uses itself — namely, DellVP11. That’s ClllCCnn, in the notation of the table. This denotes: initial cap, followed by three lower-case letters, two more cap letters, and two digits, in case you wondered. Neither [RFC1001] nor [RFC1002] discusses whether names are case-sensitive. This document clarifies this ambiguity by specifying that because the name space is defined as sixteen 8-bit binary bytes, a comparison MUST be done for equality against the entire 16 bytes. As a result, NetBIOS names are inherently case-sensitive. There’s only one way I can find to get the “real NetBIOS name” for a Windows 10 computer. It requires checking the Computer Name field in the Control Panel’s System element. On my Venue Pro, that field reads “DellVP11” (ClllCCnn). Go figure! It’s the only name that DOESN’T resolve in PING. This makes no sense to me whatsoever, but it’s indisputably true — on this particular PC at least. On some of my other PCs, PING accepts all variants of the machine name. The case of individual letters doesn’t matter. On others, it does. As I’ve already reported for my T520 Lenovo laptop, “T520” doesn’t work but “t520” does– and the latter is the apparent actual NetBIOS name string. For my X220 Tablet, “X220T” doesn’t work, but all three other possible variants do (“x220T” “X220t” and “x220t”, of which “x220t” is the actual NetBIOS name string). I have also observed the problem, this with an MFP device. I don't know if you can use some of my information, but my problem is similar, you can see if you can disable Ipv6 this might help. I don't know if it is the way that some Triumph-Adler (Kyocera, Copy Star)models are responding to the ping of the hostname when Ipv6 is enabled in the interface of the MFP. But when I disable IPv6 I can ping the hostname in Capital Letters. When you choose to install the printer with setup tool and choose to print to hostname, the port is created in Capital letters, if you manually create a new port with the hostname in lowercase the print job is released immediately. But as far as I know, Ipv6 is enabled by default as the factory setting, so end customers with Windows 10 1803 update will not be able to auto-install if they choose to print to hostname, only if they disable Ipv6 on MFP, or change port name to lower case letters. My post was too long or I have too many pictures in it, but I think that I got posted the sentence of my post. I had been suffering from the same issue, and I also got upper/lower character issue resolved after disabling IPv6. Fortunately, my router nor ISP doesn't support IPv6 yet.